Despite it’s small size, Guatemala is filled with unique locations and magical experiences . 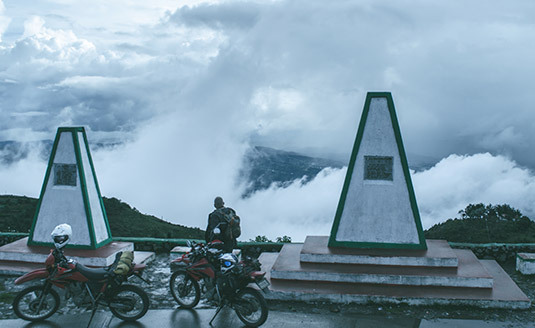 Our Motorcycle Tours visit some of the destinations below, but there are many more things to see that just what is listed here. When booking a tour with us, make sure to let us know if you have an interest in seeing something specific. We can modify our tours to accommodate most requests. We also offer other add-on excursions & activities. 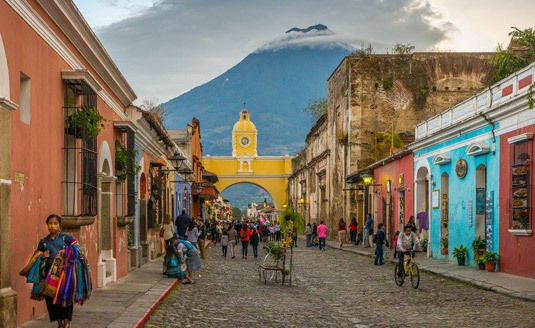 Our favorite town in all of Guatemala, and the home of MAG Tours – Antigua is a Spanish Colonial town with all its historical charm still intact. In the mid-2nd millennium it was the capital city of the Kingdom of Guatemala, before it was re-located to the current day Guatemala City. Antigua is a small bustling town surrounded by Volcanoes. There are ancient ruins spread throughout, and modern homes and businesses built into the historic architecture. It is the most popular city to visit in all of Guatemala, and with good reason. No matter which tour you do with MAG Tours, you’ll have a day or two in Antigua to explore. 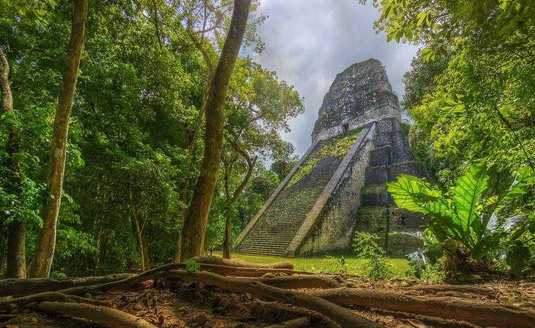 The ancient city of Tikal was the capital of the Mayan civilization in the region. It is located in the Northern jungles of Guatemala, and covered an area of nearly 16 square kilometers. Of the original 3000 structures, many still exist and can be explored by tourists. There are several large temples, palaces, city buildings, and tombs. It was abandoned in the 10th century, and is now a UNESCO World Heritage Site. Tikal is a wonderful place to spend a day. Several of our tours visit this site and include a day off the bikes to explore it. 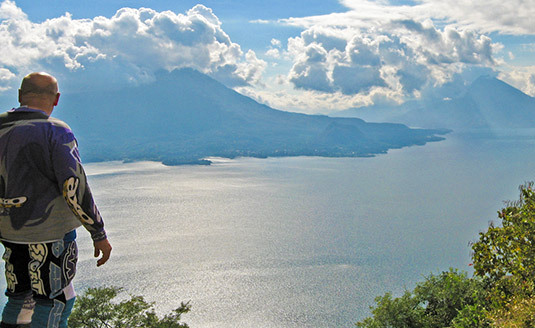 Nestled between several Volcanoes in Central Guatemala, Lake Atitlan is a must-visit. It is one of the most beautiful locations in all of Central America and has been featured in dozens of travel “Best Of” lists. A dozen lazy towns surround the lake, and all can be reached by water taxi. If you enjoy relaxing breakfasts by the water and a cold beer at sunset, there aren’t many more enjoyable places to spend a day. Most of our tours visit this location, and a couple of them even circumnavigate it. One of Guatemala’s biggest draws are the active volcanoes that pepper it’s landscape. Throughout your tour you’ll see many volcanoes, and if you’d like to hike one, it can be arranged. 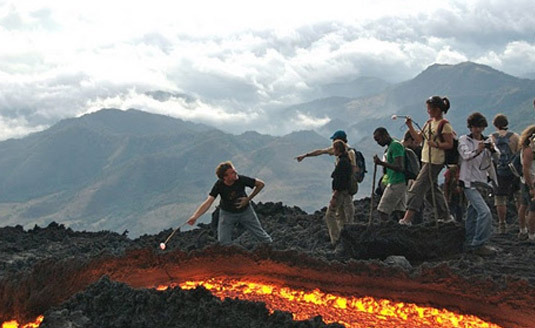 The volcano Pacaya is known for its large open ash and lava fields, and the opportunity to see hot lava. It is a relatively easy hike up to the top, which looks like the surface of the moon. 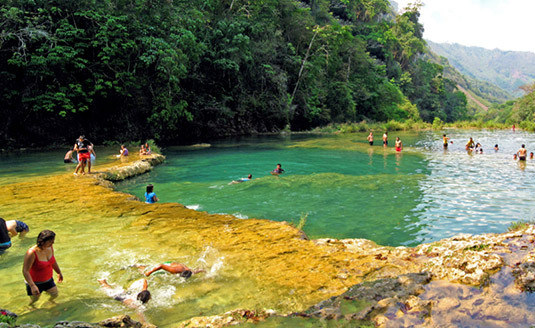 In recent years Semuc Champey has developed into a popular tourist park. Situated amongst steep mountains, Semuc Champey is a series of crystal clear pools and waterfalls. It is a beautifully unique place to spend a day. There are natural waterslides formed in the rocks, and a series of caves that can be toured by candlelight. 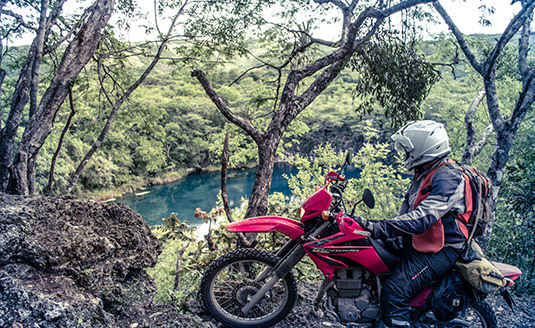 Our motorcycle tours which visit the town of Lanquin all have a day-off scheduled in Semuc Champey. 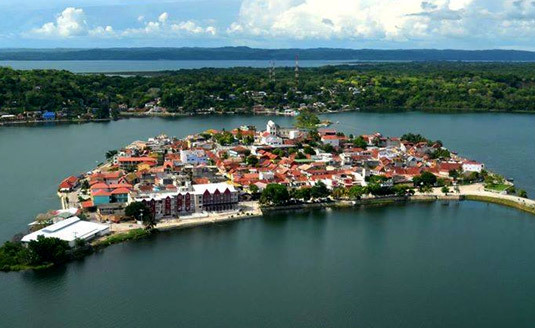 Flores is a small town compacted into the space of an island only 1 kilometer wide. In Northern Guatemala (near Tikal), Flores is as quaint as you’ll find. A cute and historic town surrounded by water on all sides and connected to the mainland by a long bridge. It is a unique town to wander around in the afternoon, and while there isn’t much traffic, there are plenty of restaurants, bars, and street vendors – and they all offer views of the water. Any of our tours that visit Tikal will also visit Flores. We use Flores as a launching point to shuttle up to the Tikal ruins. Hidden in a little-visited corner of Guatemala, out near the Mexico border, there lies a series of turquoise cenotes deep in the forest. To visit these pools we travel along long open jungle roads, and tight winding dirt paths. They are extremely remote and few people ever get to visit. These cenotes can be visited, along with several other unique spots, on our Mexico Connection Ride (or by special request). If your conception of Guatemala is hot beaches and tropical jungles, you’re forgetting about a large portion of the country. The highlands are a series of plateaus well over 10,000 feet in elevation, and peaks as high as 12,700 – all of which are accessible by motorcycle. The Highlands of Guatemala are unlike any place you’ve visited before and are likely to find anywhere else in the world. Several of our tours pass through the outskirts of the Highlands, but our Mexico Connection Ride crosses through them in all their glory. Recently opened to the public, the waterfalls of Las Conchas are a fun place to visit and stop for lunch. 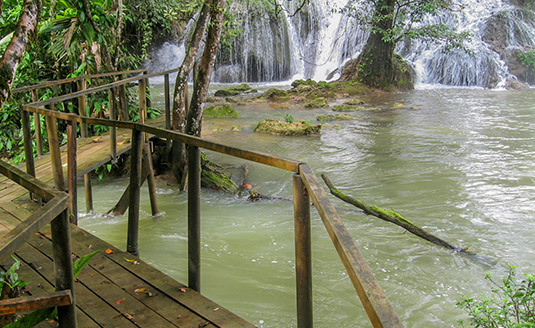 Deep in the low-land jungles, these waterfalls can be explored on a series of wooden foot bridges and lookout points built over the water. We visit this spot on a couple of our tours when we’re in route to Rio Dulce. please contact us and we’ll get right back to you.